1. How much will it cost (total) to build my outdoor fireplace? The total cost of a completed fireplace will depend on which fireplace you build and what materials you use to finish it, such as lighting, flagstone, stucco, tile, and faux stone. The approximate rough cost for each fireplace design is listed on it's description page. 2. How long will it take to build my outdoor fireplace? Expect to spend at least a few weekends building your fireplace. It will depend largely on your experience and attention to detail. Some of our customers have spent weeks and others have spent as little as 9 days. 3. If I have never worked with mortar and block, will I really be able to build my own fireplace? The easy answer is yes, however you need to understand that it may be challenging at times and will require some lifting. We will be with you along the way. 4. Do you recommend any certain design finishes for a fireplace? All finishes if time is spent in detail can be really nice. I have always liked the look of stucco and stone together, with earth tone paint. It looks rustic and classy at the same time. When lighting is added your fireplace looks great at night even without a fire burning. 5. What if I don't have all the tools that are on your "tools" list? That's OK. There's always a chance your friends and family will have the tools needed. If your'e going to buy them however, don't buy expensive if you don't think you'll use them again. Save your money as even the cheap tools will last long enough for your fireplace project. 6. What is the construction method for your fireplace designs? All of our fireplace designs are built using cinder block. Standard size blocks that can be purchased at most major home improvement stores are used. This allows the majority of our customers to easily be able to find their materials from the materials list in their construction plan. 7. I really like the ______ fireplace on your site but I want to make some changes. Can you do that? We get questions like this all the time. We will make any changes to our plans in order to make your design wishes a reality. We will work with you and provide rendered images of your design idea before you purchase the plan. Because sometimes extensive changes require extended drawing times, plan on a longer turn-around time for the completion of the construction plan. 8. Can I add a design feature like extended seating or a flared top from one fireplace design to another? Yes. Again, we can make almost whatever change you can imagine. Just bare with us while we redraw your fireplace concept. It may take a few days to complete. 9. How much will the fireplace plan cost if I want changes made to an existing plan? The price for a changed plan varies drastically as it may entail many hours of work. You'll still save thousands though in the end. Call or email us and we'll talk about your vision. 10. Can you design a custom outdoor fireplace for me from just a picture of a fireplace I found on the internet? Yes. Some of our designs came from pictures sent to us by our customers. We love it that you have a favorite design in mind even if it's not one of our existing designs. We can certainly try to get as close as possible to whatever picture you can find. This is obviously more extensive than just changing a plan, so the cost will be higher due to much more time spent on your design. Contact us and we'll talk about your idea and how we'll go about the project. 11. How much will I save by building the fireplace myself? You will save thousands of dollars by building yourself. One customer saved just under $10,000 in labor costs by not chosing to have a contractor build the fireplace. Although this is rather drastic, it does illustrate the possible savings. 12. Do you design custom outdoor kitchens as well as fireplaces? We have designed outdoor kitchens in the past and are thinking about marketing some designs to be added to our site. We are certainly interested in working with you if this is something you would like. 13. Why do your firebox designs not have angled walls and will the fireplace still draw OK? The quick answer to this question is that angled walls in a firebox are primarily for throwing and radiating heat. Because outdoor fireplaces are more for looks and not for heating your backyard, we have designed our fireplaces with deep square fireboxes so even the most inexperienced mason can build our designs. The deep firebox allows you to push the fire back enough to not feel you are sitting to close to the flame. The smoke will exit your chimney just fine and the draw will be sufficient. 14. When the wind blows, why do I get some smoke coming out the front of my fireplace? This will occur when there is wind. When the wind blows, it can enter your firebox from the front or even enter your chimney from the top. This changes the upward movement of air and sometimes creates a mini "tornado" of smoke in your firebox. This is just the nature of an outdoor fireplace. It will act no different than a firepit on a camping trip. The smoke will go different directions other than "up" when the wind is blowing. 15. Is an outdoor kitchen (barbeque) built like a fireplace? The methods of building with block don't differ depending on which you are building. I believe that building an outdoor kitchen is easier due to building at a much lower height. The overall cost may be higher depending on the grill type however. 16. Can I have you design an outdoor kitchen to fit the space I have available? Yes. 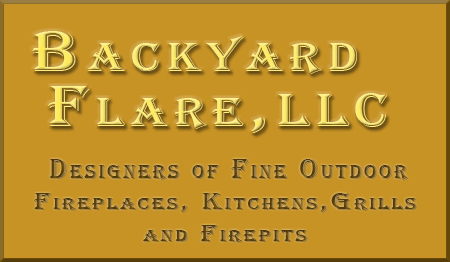 We love to hear your visions and design ideas and a lot of custom work is done by Backyard Flare each month for fireplaces, pizza ovens, and kitchen type designs. 17. Can I use the grill I already have and have an outdoor kitchen designed to fit it? Yes. On a few occassions, an existing grill has been used and a new barbeque structure has been built to house it. All we need are the dimensions of your grill and a photo. If you have further questions, please send an email to dan@backyardflare.com or call Dan at 520-269-9740.